Reader, it’s June. I know, I can’t believe it either. The school carnival is tonight. Yes, soon the cake walk will be a thing of the past. Last night Husband called from points north to check in (due to business travel he will miss the cake walk, nay, the entire carnival). Him: How are you? Me: Medium. Him: Cake walk stress? Me: Sadly, yes. I wonder… am I the only person in the world that has an iTunes play list called: cake walk? Someone tell me I’m not alone. But enough of this; on to the roundup. nouns and verbs and verbs and nouns In class the other night, we did an exercise that used 10 nouns from one our poems and 10 verbs from another; the borrowed words had to appear in order. I work this way quite often — borrowing words, mostly from other poets, and writing a draft that uses each word. But I’d never constrained myself to only verbs and nouns. Exercises are all about constraints, right? If you stare at a blank page, it can be hard to begin. But if you draw a box on the blank page (these 10 verbs, these 10 nouns, no more than 20 lines) it seems easier to get started. In class we debated which were more important: nouns or verbs. Some people thought nouns because they were the substance of the poem. Some people thought verbs because they were often used in fresh and unexpected ways that still told a truth. One person said, Well the nouns are like the bones of a poem, and the verbs are the muscle. I liked that idea. If you want to try this exercise, let me caution you to be careful about the poems you borrow words from. One classmate had to use the words Pope and kitten. Another, spaceship. But remember, prompts and exercises are really just doorways into a draft — they are meant to be discarded as the poems take off (aren’t they?). a farewell I was very sad to learn yesterday that Brain, Child magazine will no longer be published. Another casualty of a poor economy and the decline of print periodicals. Brain, Child was the only parenting magazine I could stand to read. There were no doggy-trick articles (“Three Steps to Perfectly Behaved Children!”), no product pushing (“10 Must Have Items for your Nursery”), no quizzes to seal your fate as a parent (“What Type of Parent Are You? Take This Quiz to Find Out!”). Instead, there were thoughtful, well-written articles about the complexity of parenting, the dark and light, the mess of it all. Here is one article I’ve been particularly grateful for: Love With Teeth. The simple truth of the last sentence has gotten me through some tough days with my tough kid. I’m sad to see Brain, Child go. Read more about this magazine and its transition here. ‘O then I was happy’ Did you know that yesterday was Uncle Walt’s birthday (Raise your hand if you, too, call Walt Whitman ‘Uncle Walt’ because of Dead Poet’s Society)? Did you know Uncle Walt self-published, wrote glowing reviews of his own work, and was largely unappreciated during his lifetime? And yet, now he is celebrated and regarded as the first person to write a truly American poetry. 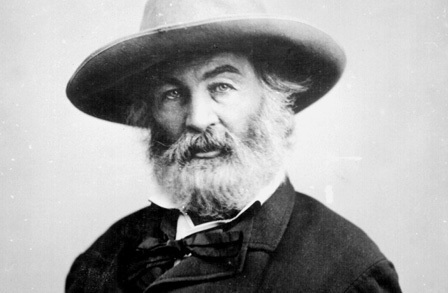 Here is one of my favorite poems by Walt Whitman : When I Heard at the Close of the Day (Go read it, really! What can I say? I’m a sucker for a good love poem). And now, reader, the time has come for me to finalize the cake walk play list. If you need some good cake-laughs, visit this blog. It’s always good for a chuckle. Have a great Friday, and thanks for reading. This entry was posted in creative process, poems - others', process notes, prompts & exercises, roundup, Uncategorized and tagged creative process, poems - others', poets, prompts & exercises, roundup by Molly Spencer. Bookmark the permalink. Happy Cake Walk & Carnival! I hope it all goes smoothly or if not smoothly that there is lots of laughter involved. Hooray for Walt Whitman! I had forgotten that he wrote his own (glowing) reviews…hmmmm…another trend to revive along with self-publishing? It appeals to the rule-breaker that lurks within. Thanks, Sandy. I would definitely settle for laughter! Have a wonderful weekend. That class sounds great! Mind sharing the who / where / what of it all ? I’d love to take a class like that. Enjoyed your Friday Roundup….as always! Thanks for reading Mrs. B.!